I was surprised to get these....from my older daughter. Believe me this photo does not do them justice. The roses are more a peachy-pink color. All the colors have a fall feel to them...they came Friday which was one reason they were such a surprise. (By the way, both photos need to be clicked on to enjoy more.) Anyway, they are gorgeous. Then Sarah had us over Saturday and cooked dinner for us...she fixed this yummy dish called Melt in Your Mouth Chicken...and it did. I am pretty sure this is the recipe she used...only she used chicken thighs. Plus she got me a puzzle...and a big sack of sunflower seeds. Beautiful flowers - and beautiful little girl too! A beautiful bouquet which I enjoyed in the enlarged view. Lorelei has her best smile on for this special occasion. Excellent shot of her. beautiful flowers and what a SMILE... and i like that pink dress. 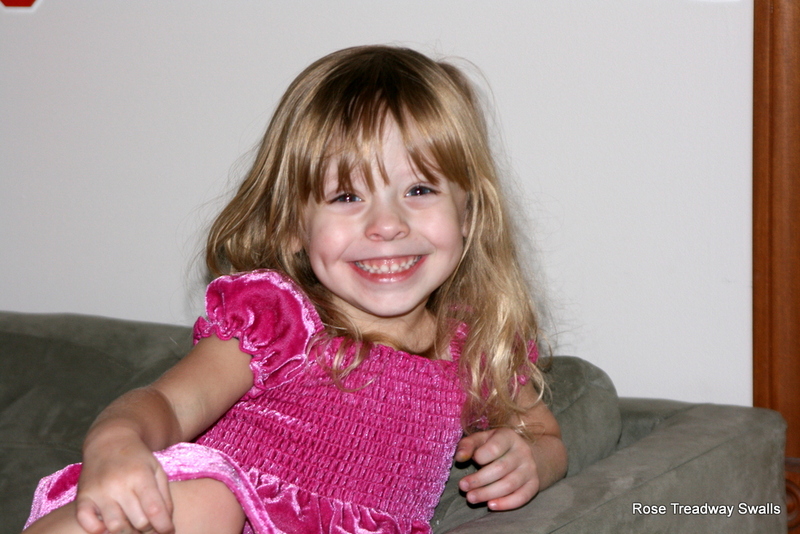 Awww, look at that face & those dimples & those eyes... she's so cuuute! Happy Belated Birthday, Rose! So happy you got to visit with your granddaughter and your roses are breathtaking! 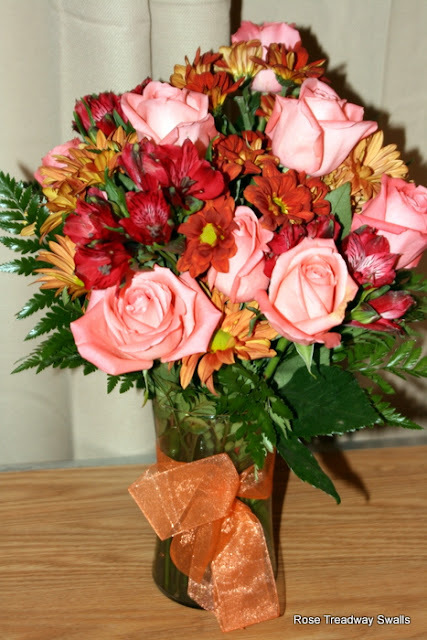 Looks like you had a wonderful time with your family... Love your flowers --and that is a precious picture of Lorelei. Happy "Belated" Birthday!!! I just love her smile, I'm going to check out your recipe link. Cute, cute photo of Lorelei! Oh I missed your birthday Rose, but better late than never eh!! Your flowers are lovely and so is Lorelei and she does have lovely sparkly eyes. Happy belated birthday, Rose! The flowers are gorgeous! Lorelei sure has a beautiful smile. Happy belated birthday; looks like it was a good one. Happy Birthday, Rose!!! Fantastic bouquet and sweet little Lorelei!